A reflective dog collar is an essential safety accessory for your dog. They are the ideal solution for those late afternoon or evening walks. As the roads become more busy, and possible more dangerous, it's important to be seen at all times - and most importantly in the dark. A reflective dog collar is a great solution to alert motorists to the fact that both your and your dog are out for a walk. A reflective dog collar will reflect the light from a motorist's headlights from a surprisingly long distance. This will help make it obvious that care should be taken when approaching. 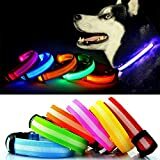 Here's a selection of both cheap and not so cheap reflective dog collars available on Amazon. There's a great choice! Most importantly (and obviously) the reflective dog collar you buy will need to fit your dog. This isn't difficult - it's just a case of measuring your dog's neck and choosing a reflective collar to suit. As with all types of dog collar, reflective dog collars come in a variety of materials. Whether it's nylon or otherwise, it's best to choose the material that you feel will be most comfortable on your dog. Reflective dog collars are normally quite light so they won't cause any undue strain on your dog's neck. Because of their bright appearance, they also look pretty snazzy. 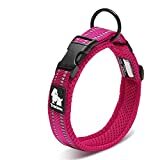 With a great deal of choice when it comes to colour, there's plenty of opportunity to make sure that the reflective dog collar you choose will also double as a great fashion accessory! 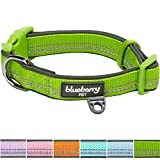 Most reflective dog collars are adjustable meaning that they are versatile too. 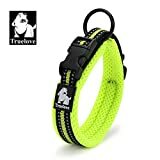 When you buy one, it's a good idea to check how far around the collar the reflective material runs. If it runs the full length of the collar, then it's likely to reflect more light than others, making them an extra safe choice. Here at Loving Your Pet we really recommend reflective dog collars as a must have safety accessory for walks in the dark. For an even better level of safety (and if your dog wanders off in the dark), why not find out about flashing dog collars too?